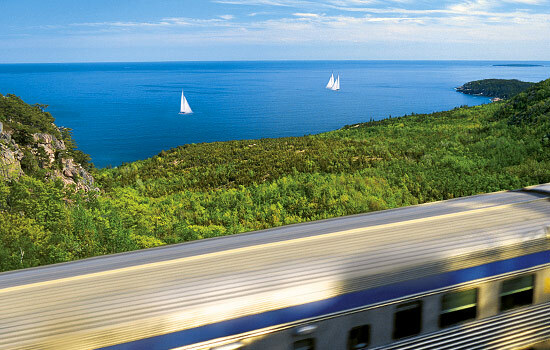 Experience Canada’s magnificently diverse scenery as you explore the country by rail. Journey from Toronto’s bustling city streets and then take in the rustic prairie landscape before arriving in the spectacular Canadian Rockies. Marvel at the power of Niagara Falls, relax along the shores of Lake Louise and watch for wildlife while driving the famous Icefields Parkway. This 13-day adventure introduces you to Canada’s most iconic and unforgettable attractions. Enjoying three days on a VIA Rail train. Welcome to the bustling energy of Canada’s largest city. Toronto is known for its diverse population, thriving art scene, excellent bars and restaurants and so much more. As soon as your flight lands, you can get out and explore the city. Wander the streets and explore, tempted by the aroma from a Chinese bakery, the sounds of a street performer playing guitar or the colourful fashions in a window display. Take in all the sights and sounds that the city has to offer. We want to make sure you eat at the best spot in Toronto – and what better spot than the CN tower? Marvel at the spectacular views as you eat world class cuisine. Relax, because you’re travelling the Fresh Tracks Canada way – we have the inside scoop to ensure your vacation is off to a great start! Spend a day enjoying the quaint and colorful neighborhoods for which Toronto is famous or discover the famous Niagara Falls. 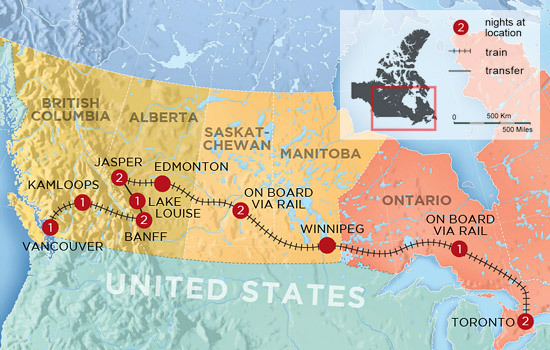 This morning your journey across Canada by train begins. Relax inside your comfortable cabin on VIA Rail’s The Canadian. This train will take you from Toronto to Jasper over the next three days, traveling past pristine lakes, forests and rivers along the way. Overnight onboard the train in your private cabin. 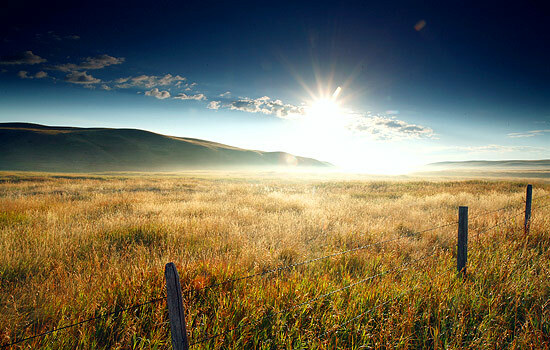 Leave the forested lake lands of Ontario and enter the plains of the prairie provinces, where fields of grain stretch to the horizon. Admire the expansive prairie skies and the occasional grain elevator or tiny historic town as you watch the scenery go by from your window. Arrive in the quiet mountain town of Jasper, where the scent of pine trees and the calls of mountain songbirds fill the air. This small community is nestled within rugged mountain peaks and surrounded by rivers, forests, canyons and other natural wonders. Jasper will welcome you with friendly local shops and hotels, providing you comfort and convenience even in the wilds of the Canadian Rockies. Spend an entire day drinking in the untouched beauty of Jasper National Park, from the crystal clear glacial lakes to the rugged mountain peaks. Experience the thrill of riding in a sidecar of a powerful Harley Davidson touring motorcycle – view famous lakes, historical viewpoints and attractions of the Jasper Area. This is a sightseeing tour unlike any other for 1 or 2 people. Explore Jasper National Park on a professionally guided interpretive walk. Enjoy a leisurely pace, and plenty of time for photos and discussion. See wildlife, get close to rare alpine wildflowers, and stunning valley views. Activity rating: Moderate (approx. 4 miles | 6.5km) – more challenging hikes are available on request. Watch out for antlers peeking through the trees on this small group sightseeing tour by mini-coach to Maligne Canyon, Maligne Lake and a cruise to Spirit Island. Insider tip: Want to explore the town instead or simply just kick up your feet? With the help of your Vacation Advisor, you can customize your day to make it your own. 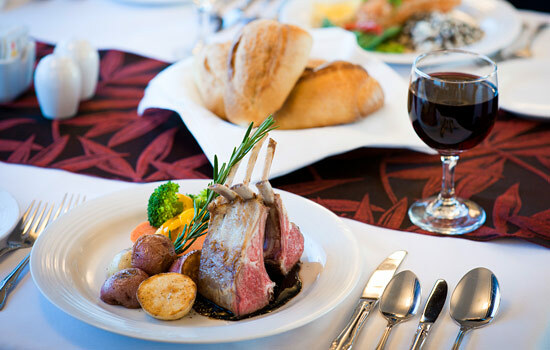 Enjoy a sampling of flavours and sips from around Jasper on a fabulous food tour, take the sightseeing Skytram ride to the top of Whistler Mountain to enjoy the spectacular views, or just take today to rest and relax. Enjoy a day discovering the Icefields Parkway, a truly remarkable rugged mountain landscape. 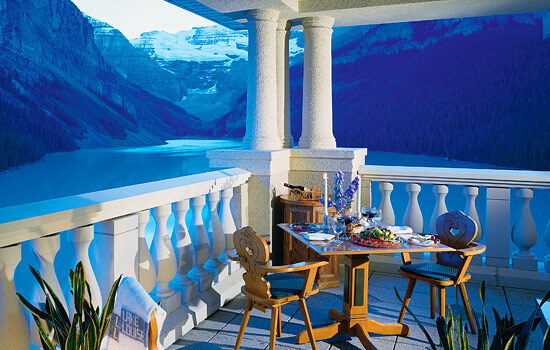 Travel along the spine of the Rockies to picture perfect Lake Louise. With a small group and guide, explore the Icefields and its main attractions As you walk along the surface of the enormous Columbia Icefield and the Athabasca Glacier, you will feel like you have been transported back in time millions of years to the ice age. Roll across the glacier on an enormous Ice Explorer vehicle, with wheels as tall as you are and marvel at the Glacier Skywalk. Keep a look out for elk, moose, mountain goats, sheep or even bears – there’s a great chance that you’ll spot them in this area. In the late afternoon arrive in the stunning Lake Louise area. 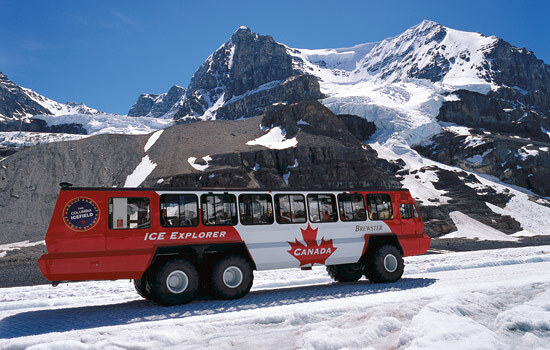 Spend the day with a private driver-guide, to explore the Icefields at your own pace. Then, step away from the crowds and take a helicopter tour abundant in natural beauty, glaciers and waterfalls. Leave from an exclusive Icefields base and soar over Cline Pass and over Cline, Lion and Lioness Glaciers. 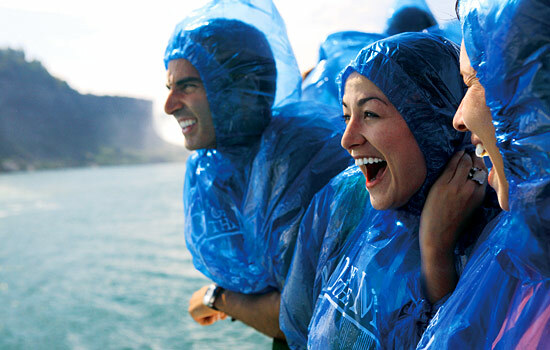 You’ll also view a spectacular 900ft waterfall flowing from 2 aqua green lakes! Today the morning is at your leisure in Lake Louise. You may wish to simply relax and soak in the views and enjoy free time. 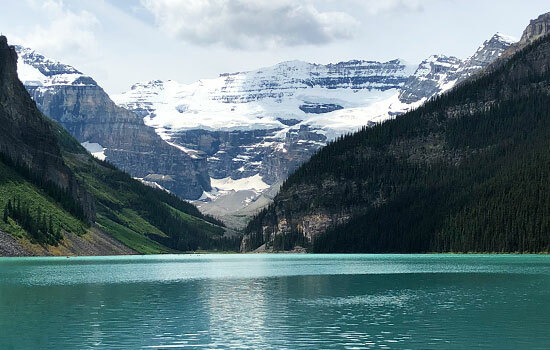 Or, ask us for our Lake Louise Activity Menu, from which you can choose activities such as a scenic canoe paddle, Lake Louise interpretive gondola ride, or Afternoon Tea. 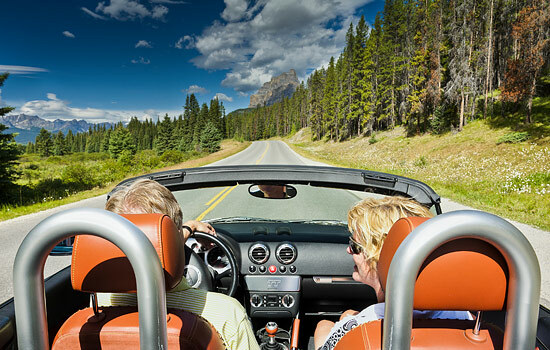 In the afternoon, enjoy an interpretive scenic transfer to the vibrant mountain village of Banff, a town with a friendly vibe and a happy, laid back energy. Stroll down Banff Avenue and explore the unique local galleries, welcoming cafes and restaurants, sweet shops and quirky boutiques. There’s always something happening in bustling Banff – quite a contrast to the quiet night on the shores of Lake Louise. The town of Banff is nestled within some truly wild and gorgeous mountain scenery, so spend a full day exploring it. Take the Rocky Mountaineer on a scenic journey from the mountains of Banff to the interior of beautiful British Columbia. As you travel, the towering peaks transform into rugged foothills, lakes, rivers and ranch lands where cows and horses roam. Watch spellbound as you pass by glaciers and waterfalls as well as Rogers Pass, Kicking Horse Canyon, the Spiral Tunnels, the Continental Divide and Craigellachie – where the workers who built the Canadian Pacific Railway drove in the last spike. From the dry interior of British Columbia to the lush greenery of the coast, today you will travel from Kamloops to Vancouver. 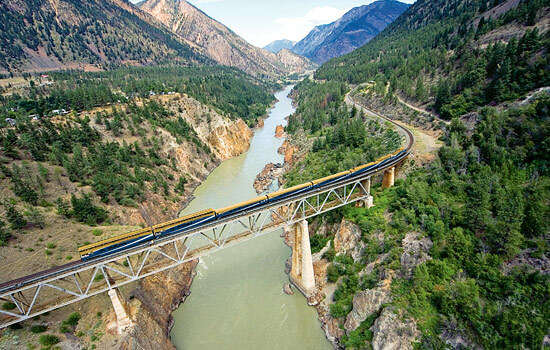 The train weaves through pristine forests, past waterfalls and rivers and alongside dramatic canyons from the fertile Fraser River Valley to the Coast and Cascade Mountains. Take in the rushing waters of Hell’s Gate in the Fraser Canyon and the steep slopes of the Thompson River. Your rail journey ends on arrival in Vancouver this evening. 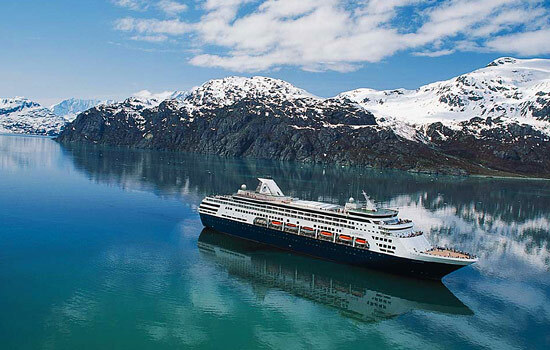 Catch your departing flight from Vancouver and say goodbye to the amazing wilderness of Canada. You’ll arrive home with many amazing stories to tell about your adventures across Canada by train. • Icefields Parkway tour is available from April 29 till October 7, 2019 departures, coach transfer will be substituted prior to April 29, 2019. • Maligne Lake cruise runs from May 27 to September 30, 2019 departures, weather conditions may cause season delays. A walking excursion will replace the cruise when unavailable. • Sunshine Village hike and Gondola available from June 24 to Sept 9, 2019 departures. Banff Gondola ride can replace Sunshine Village when unavailable. • The privately guided nature walk in Jasper is available from April 29 to October 7, 2019 departures, for best walking and hiking conditions we recommend taking this tour in June or later. 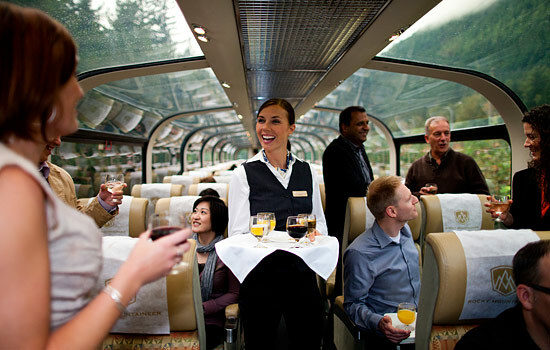 • Upgrade to GoldLeaf Service aboard the Rocky Mountaineer – excellent food make this option a must, and dome windows and an outdoor viewing platform optimize your view of the passing scenery and allow for wonderful photographic opportunities . 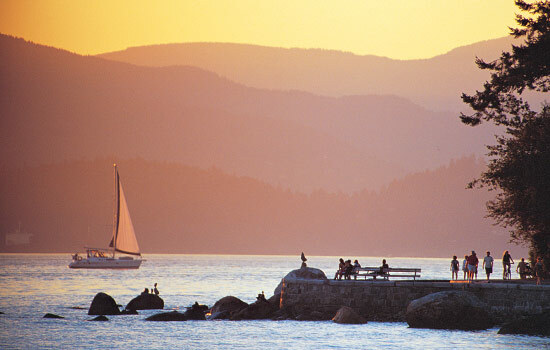 • Experience the unique culture of the Pacific Northwest by adding a trip to Victoria, the quaint capital city on Vancouver Island. 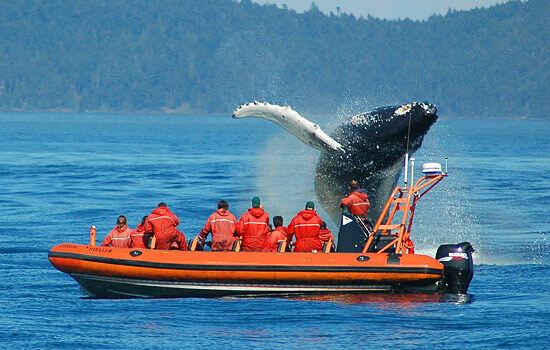 When there, you can go whale watching and visit the famous Butchart Gardens. 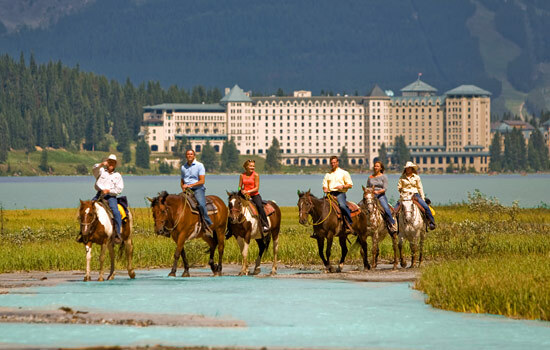 * Trips starting in Vancouver are 14 days long, including an additional night and tour in Banff.